Analysts always strain to generalize about elections. We want to “model” them, find the common elements, and project them as early as possible based on the commonalities. That’s a legitimate approach, but we need always remember that every election is different. Every single one. It isn’t just the candidates that change up, or the specific events that end up defining an election season, or the particulars about presidential and congressional job approval. In midterm elections, especially, the combination of competitive districts and states varies greatly, expanding or contracting the potential for change. Last year, and even in the beginning of 2014, we and others were inclined to think that 2014 would be another wave midterm, like 2006 or 2010. After all, it’s the “sixth-year itch” of the Obama administration — always a dangerous time for the White House party — and President Obama’s popularity had been sinking well below the 50% level. Then there was the Senate map for 2014. Arguably, this year features the best lineup for the Republicans since 1980. Almost all — some would say all — of the GOP’s 15 Senate seats are either in the bag or will be by Election Day, owing to the Red nature of the states. By contrast, many of the 21 Democratic seats are located in Red or Purple states, some with shaky incumbents and others left vacant for easy Republican pickup. Finally, midterm turnout usually (not always) favors Republicans, with poor turnouts registered by Democratic-leaning groups such as minorities and the young versus decent turnouts by GOP cohorts, including whites and those over age 60. Well, it’s late July, and so far at least, this election hasn’t gelled quite the way it earlier appeared on paper. President Obama’s popularity isn’t impressive, but his job approval seems to have stabilized in the low-to-mid 40s — not as bad as President Bush’s level in 2006 (about 37% approval roughly this time eight years ago). Several of the most vulnerable Democratic senators on the ballot are proving more durable than expected, fending off challenges or at least holding their own so far. In 2006, Democrats at this point were up double digits in most surveys of the House generic ballot, a poll measuring the general mood of the country that suggested not only Democratic gains in the House, but also the Senate. Four years ago, Republicans by this time had taken a three-point lead in the generic ballot surveys, a lead that would only grow. Now, Democrats retain a tiny, one-point edge. 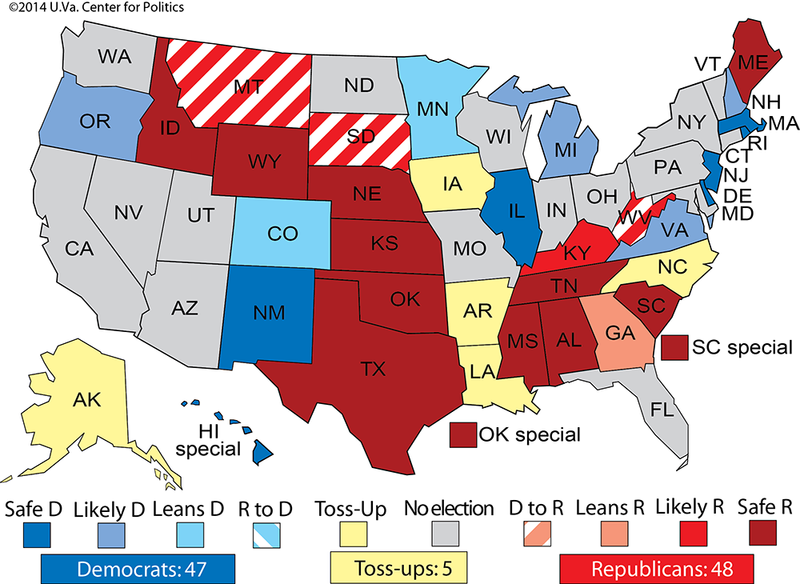 Let’s stipulate that a wave can develop late in the season, in September or even October, and if it does in 2014, it will be colored Red and the Senate will surely go Republican. Even without a wave, there’s a fair to good chance the GOP will end up with the six net seats they need for control — and little chance they’ll pick up fewer than four seats in any event. But 2014 is no 2006. The electorate had turned off to George W. Bush and would never again turn on. The Iraq War and Hurricane Katrina were two principal reasons. The full Democratic wave emerged in the fall, after some GOP congressional scandals, but even at this point in 2006, we were just debating how high the Democratic tide would rise. 2014 is also no 2010. All of the energy was on the Republican side four years ago, as Obamacare bombed, the Tea Party arose, and the poor economy that helped elect Obama lingered. The building GOP wave was so impressive that the Crystal Ball was able to predict a House switch from Democratic to Republican control by Labor Day even though Democrats held about a 75-seat majority at that time. Perhaps Americans are just late tuning in this year. It could be that foreign and domestic events will conspire to lower Obama’s job approval rating further. Maybe the favorable Republican map and midterm turnout advantage will assert themselves fully on Election Day (though Democrats are doing their best via micro-targeting and get-out-the-vote operations to reverse the normal pattern). If there is political energy out there in the 2014 electorate to match either 2006 or 2010, it has escaped our attention. Obama and the congressional Democrats are undeniably unpopular, yet congressional Republicans have even lower ratings. Partisan redistricting has reduced the number of truly competitive House districts in a general election to an absolute minimum, also reducing interest and excitement. Also, this is the Senate class of seats that involves only about half of the nation’s voters, in contrast to the roughly three-quarters engaged in the seats to fill the other two Senate classes. We could be reading too much into the summer doldrums, which causes us all to sag a bit. Crisp autumn air may change our outlook and perk up the voters — but whatever the fall weather, our basic conclusion will remain, that every election is different. Despite the uncertainty of the overall Senate outcome, there’s been some movement in individual races, which are reflected in six Crystal Ball Senate rating changes. The biggest change comes in Iowa, which moves from Leans Democratic to Toss-up. After cruising through her primary, state Sen. Joni Ernst (R) has continued to perform well. Polling averages now show the race to be about an exact tie, and it’s become fairly clear that this open-seat contest represents the Republicans’ best pickup opportunity in a state won by President Obama in 2012. One red flag for Rep. Bruce Braley, the Democratic nominee, is apparent as he tries to work his way toward 50%. At 43% of the vote in a recent NBC News/Marist College poll, Braley is already running six points ahead of President Obama’s approval rating, which is at 37% in the poll. Presumably, Braley is going to have to squeeze some more votes out of a remaining pool of voters that isn’t particularly high on the president. (This is a challenge for any Democrat not currently close to 50% in polling.) The Democratic Senatorial Campaign Committee seems to have recognized Braley’s plight and has placed a half-million-dollar ad buy. This is only the third place where the committee has gone up on the air so far, according to Politico: The others have been Arkansas and Montana, both places with beleaguered Democratic incumbents. Given the Republicans’ difficulties in defeating large numbers of Democratic Senate incumbents in any election since 1980, a strong performance in open seat races is crucial to their success. If they find a path to the six seats they need to flip control of the Senate, it seems increasingly likely that Iowa would be part of it. That could potentially make Iowa the decisive state for the Senate. Earlier in the cycle, we suggested that the winner of two of these three Democratic-held states would be in great shape to win the Senate: Alaska, Louisiana, and North Carolina, which we have long categorized as Toss-ups. But now that may not be the case: Democrats, in particular, could win two of these three and still narrowly lose the Senate. Of the seven states won by Mitt Romney in 2012 where Democrats are defending seats — Alaska, Arkansas, Louisiana, Montana, North Carolina, South Dakota, and West Virginia — it appears that the Democrats are doing best in Alaska and North Carolina. Sen. Mark Begich (D-AK) is running an excellent campaign, and the favored candidate of national Republicans, former state Attorney General Dan Sullivan, has been stuck in a long primary slog against Lt. Gov. Mead Treadwell (R) and 2010 GOP nominee Joe Miller (R). Sullivan is catching it from both Democrats and his fellow Republicans right now, and some Republicans are worried that he’ll be so damaged he won’t be able to catch Begich, assuming he wins the Aug. 19 primary. Meanwhile, it appears Sen. Kay Hagan (D-NC) has taken a small lead on state House Speaker Thom Tillis (R), who may be losing points with voters because the unpopular state legislature’s session is in overtime. Hagan and Tillis both have weak numbers — so weak that a Libertarian with some amusing YouTube uploads, Sean Haugh, is polling in the mid-to-high single digits. Both of these races remain Toss-ups, but Democrats look slightly better positioned in both at this point. Our “best two out of three” argument from earlier this cycle might be inoperative because Iowa is now so competitive. At this point, the most plausible path to a bare Republican majority of 51-49 looks like this: Beat incumbents in Arkansas, Louisiana, and Montana, and win open seats in Iowa, South Dakota, and West Virginia. Hence the Hawkeye State’s increased importance in the Senate landscape. Among the seven Romney-state Democratic seats, there are two ratings changes: West Virginia and Montana go from Leans Republican to Likely Republican. We’ve long looked at Rep. Shelley Moore Capito (R) as an excellent recruit for the Mountain State seat, and while Secretary of State Natalie Tennant (D) is also a strong candidate, this really does seem like the year for West Virginia to elect its first Republican senator since the 1950s. Also moving in the same direction is Montana, where Rep. Steve Daines (R) has established a clear lead and Sen. John Walsh (D) was rocked by plagiarism accusations Wednesday afternoon. Between this latest scandal and Walsh’s previous troubles, it seems the appointed senator may not be ready for primetime. Even two recent friendly polls (a campaign internal from Walsh’s camp and a survey from Democratic pollster Public Policy Polling) found the incumbent trailing, and those surveys came out prior to the plagiarism story. The Montana and West Virginia races join South Dakota as the likeliest Republican pickups in November. Meanwhile, the Arkansas and Louisiana races appear to be in holding patterns, with both Sens. Mark Pryor (D-AR) and Mary Landrieu (D-LA) in deep but not necessarily worsening trouble. One minor development in the latter race was the exit of state Rep. Paul Hollis (R) from the all-party primary field, which slightly reduces the possibility of a December runoff between Landrieu and Rep. Bill Cassidy (R) if — as is considered likely — no one gets over 50% on Election Day in November. As Iowa moves up the competitive ratings, a couple other Democratic-held seats are moving down. Earlier this year, Michigan and New Hampshire looked like two prime opportunities for GOP gains. In Michigan, former Secretary of State Terri Lynn Land (R) was tied or leading in public polls, and she continues to raise good money while also self-funding to a considerable degree. Meanwhile, Republicans pushed and pushed and finally tipped former Sen. Scott Brown (R-MA) off the fence and into the race against Sen. Jeanne Shaheen (D-NH) in the often-volatile Granite State. But it doesn’t look like either of these races are panning out for the GOP, and we’re moving both from Leans Democratic to Likely Democratic. Michigan is just a fool’s gold state for Republicans: Federal races there often appear highly competitive, but Democrats typically settle in to win handily. Despite the national climate, nothing we’ve seen here suggests that Land is the candidate to break the pattern of recent history. Rep. Gary Peters, the presumptive Democratic nominee, appears fairly well positioned about a month before Labor Day. Meanwhile, Brown entered the New Hampshire contest already well known, but that does not necessarily mean he’s well-liked. In polling, Brown’s favorability and unfavorability are typically either about even — as they were in a recent NBC News/Marist poll showing him down eight points to Shaheen — or negative, and he’s done little during the campaign so far to improve those numbers. One final rating shift that will leave many shaking their heads is in Minnesota, where we’re changing the rating from Likely Democratic to just Leans Democratic. But hear us out: While polling doesn’t really support such a move, history suggests this race won’t be a cakewalk for Sen. Al Franken (D). Six years ago, Franken won by the barest of margins (312 votes) against incumbent Sen. Norm Coleman (R) only after a lengthy recount process. Moreover, despite its long run of voting Democratic in presidential elections (it last went Republican in the 1972 Richard Nixon landslide), Minnesota is not actually that Democratic. After all, Coleman was elected in 2002 and nearly reelected in 2008. In fact, if we compare it to Michigan, a state with a Senate race we’re moving in the opposite direction, Minnesota has been, on average, 1.3 percentage points less Democratic in the two-party vote than Michigan in the last four presidential elections. Moreover, President Obama won Minnesota by 7.7 points in 2012; while this was a comfortable margin, it wasn’t at the level seen in states such as Michigan (9.5 points), New Mexico (10.1), or Oregon (12.1). Second, this race hasn’t hit its stride yet. Franken and his likely opponent, businessman Mike McFadden (R), are really just getting started, given Franken’s deliberately low profile and the fact that McFadden hasn’t even officially sewn up his party’s nomination. It’s true that the contestants in Michigan and New Hampshire haven’t received official party blessings either, but Peters versus Land and Shaheen versus Brown have been de facto head-to-head races for months. One thing that’s clear: Franken won’t be surprised, given that he’s already spent $10 million on his race so far this cycle. It may seem odd, given polling and conventional wisdom, to give Democrats better ratings in Michigan and New Hampshire than Minnesota, but if there’s a race this year that develops late, we think it might be here. Left unmentioned so far is Colorado: There’s a case for it to be made a Toss-up, but we’re holding it as Leans Democratic for now. Sen. Mark Udall (D-CO) remains a formidable candidate, and Colorado is another place where Republicans have had recent difficulties in winning big statewide races. We also do not yet know the effect of the state’s new all-mail balloting, but it could very well have the effect of helping Democrats generate a bit higher turnout than one would expect in a midterm year. Also, polls in Colorado tend to understate Democratic performance: The final HuffPost Pollster average of Colorado in 2012 showed Obama up just 1.7 points on Romney (Obama won by 5.4 points) and, in the 2010 Senate race, Ken Buck (R) was up 1.4 points in the final polls, but Sen. Michael Bennet (D) ended up winning by 1.7 points. Udall and Gardner are essentially tied in the most recent poll averages, but we still narrowly favor the incumbent at the moment. On the Republican side of the ledger, we continue to monitor the Democratic challenges in GOP-held Georgia and Kentucky. On Tuesday, Republicans picked businessman David Perdue in a runoff to be their Senate nominee in the Peach State; we’ll see if Perdue’s victory moves the polls at all, which currently show a small lead for nonprofit executive Michelle Nunn, the Democratic nominee. We have a Leans Republican rating there despite the polls. Georgia is shifting gradually in the Democratic direction, but probably not fast enough to elect Nunn this November. We also still believe that Senate Minority Leader Mitch McConnell (R) is decently positioned in Kentucky over Secretary of State Alison Lundergan Grimes (D). Our view has held despite McConnell’s dreadful personal approval ratings as well as close horserace polling. Remember that our Likely Republican rating there says nothing about the margin of victory: If McConnell does in fact win, it almost certainly won’t be by many percentage points. Again, Georgia and Kentucky are Republican states, and this looks like at least a mildly Republican year. We’ve made this point many times, and it’s very simplistic, but it’s the best argument in favor of GOP holds in both states. Overall, we’re holding steady on our outlook of a Republican gain of between four to eight Senate seats. This week’s ratings changes, and an updated map of our ratings, are below. One final note: Yes, we know that the polling in some races we call “likely” is basically the same as the polling in states we call “leans,” and that there are other seeming inconsistencies in the ratings. Just to reiterate, though, our ratings are a holistic project: We take polling, electoral history, candidate quality, and information from our sources into account. We will continue to tweak them down the stretch before calling all the races by Election Day (though we might have a couple of “Leans Runoff” ratings in the anticipation of overtime in Georgia and Louisiana). Despite his best efforts to torpedo himself, Sen. Pat Roberts (R) is still the favorite to win renomination in the Jayhawk State’s Aug. 5 GOP primary. Roberts has been gaffe-happy and vulnerable to the same kind of residency attacks that hampered former Sen. Richard Lugar (R-IN) in his 2012 Republican primary defeat. However, unlike Lugar’s race, Roberts’ GOP opponent, physician Milton Wolf, is decidedly second tier. Wolf has his own problems, particularly the bizarre, disturbing episode where he posted supposedly confidential X-ray photos of gunshot victims on Facebook — and then made it even worse by making macabre comments about them. Had one of Kansas’ Republican members of the U.S. House decided to challenge Roberts, it would be easy to see him losing on Aug. 5. But at the moment, Roberts remains a favorite. Still, don’t completely write off Wolf’s chances. A low-turnout summer primary and Roberts’ problems could prove to be the formula for an election shocker.